Dimo V3.0.0 Released with the ability to support all Blu-ray/DVD backup, Batch video conversion and convert video file into animated GIF file format. Looking for 2017 best all-in-one media solution? 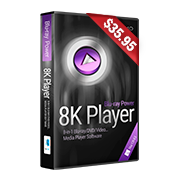 Check upgraded Dimo VCU V3.0.0, mate series to download, convert, edit and share your movies and songs. Dimo Video Converter Ultimate has just published the best video downloader in V2.7.4 to enrich its add-on service from YouTube, Vimeo, Dailymotion, Facebook and other video-sharing sites, so that you just need to copy and paste a URL from various webs into the program. Response to users' equal expectation for a more powerful Blu-ray/DVD ripping and copying, Dimo Video Converter Ultimate V3.0.0 could rip Blu-ray and convert DVD of any type - more new disc file systems (Blu-ray ISO, Blu-ray Folder, DVD Folder) are added, regardless of disc protection and region restriction. That means, if you desires is not only to rip and convert Blu-ray/DVD to video and extract audio off Blu-ray/DVD to save in all formats for any media player and device, then it offers you the best solution to copy Blu-ray movie and copy DVD movie without quality loss. Besides, this Blu-ray/DVD copy software could 1:1 copy Blu-ray disc of folder, copy Blu-ray folder and ISO image file, backup DVD disc to Video_ts folder as well. 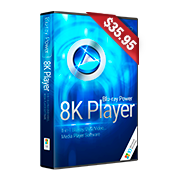 A batch video converter can be extremely useful for converting a large number of videos for a mobile device or for mass editing. That's why Dimo Video Converter Ultimate V3.0.0 has taken the batch video/audio conversion into its updates, so you can convert all of your favorite video clips into mobile friendly versions of the files. To vivid your digital life, GIF is one of the most popular image format on the social networks and still gaining more and more popularity. 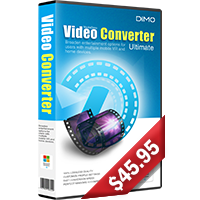 Therefore, Dimo Video Converter Ultimate V3.0.0 allows users to create gif from all popular videoformats like .wmv, .mp4, .mkv, .evo, .dat, .wav, .mpeg and .avi etc. then you need not to worry about compatibility issues. Move up, you can create your own animated GIF from any video to gain lots of fun today. 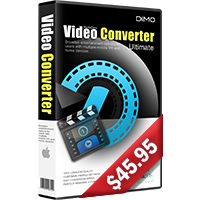 The upgraded Dimo Video Converter Ultimate, DVDmate, BDmate, Videomate, for Win/Mac both support Windows 10, and work well on even the latest macOS Sierra. 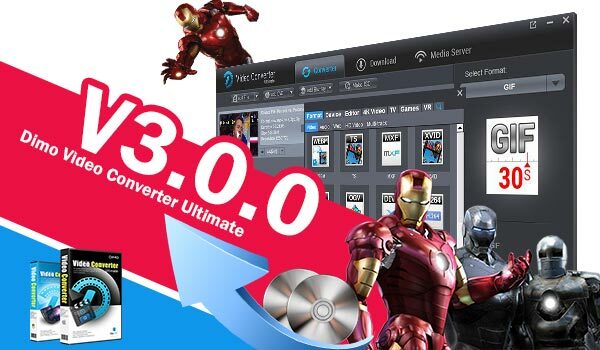 The enhanced ultimate video converter are normally priced at$43.95 and $45.95 respectively for one year license or lifetime version. Have more questions or need more coupons, please feel free to contact support team or leave a message at Facebook.